I don’t know if you’ve ever heard the story of the ant carrying a contact lens. This story is mentioned in many religious sites, and every body applies different names to the people in the story in accordance with the country it is mentioned in. In fact, it does not matter whether you use “Ann” or “Zehra” as a name because we are only interested in the essence of the story. I heard this from my Turkish friends so I will use the name , “Zehra” for the main person. Zehra was a young woman who was invited to go rock climbing. Although she was scared to death, she went with her group to a tremendous granite cliff. In spite of her fear, she put on the gear, took a hold on the rope, and started up the face of that rock. Well, she got to a ledge where she could take a breather. As she was hanging on there, the safety rope snapped against Zehra’s eye and knocked out her Contact lens. Well, here she is on a rock ledge, with hundreds of feet below her and hundreds of feet above her. Of course, she looked and looked and looked, hoping it had landed on the ledge, but it just wasn’t there. Here she was, far from home, her sight now blurry. She was desperate and began to get upset, so she prayed to Allah to help her to find it. When she got to the top, a friend examined her eye and her clothing for the lens, but there was no contact lens to be found. She sat down, despondent, with the rest of the party, waiting for the rest of them to make it up the face of the cliff. “Allah– surely nothing is hidden from Him in the earth or in the heaven.” Ali Imran-3/05. Allah has not created anything without a reason. In this wheel of life, every body carries a load on his back from place to a place without knowing why he is carrying it. There are sweet loads which people carry on their back with pleasure happily. A father is responsible for providing sustenance for his wife and children. This is a nice load on his shoulders and he is more than happy to carry it. There are many mothers and fathers who have disabled children and they dedicate their lives in minding their vulnerable children. I have some friends from such mothers and fathers, lets mention some of them over here. We had a neighbour couple in our summer house around 1980’s, this couple had a disabled child. The child was not sensing anything below her waist, as no nerves were developed from birth in her legs. This couple was handling their children with care because changing the position of the child was sometimes ending with damaged vein and the child was not realising as she felt nothing . The father left his main work and all his career prospects and they have been looking after her for years day and night. Another neighbour, Miss Nese was an English Teacher. She had a child whose legs and arms were crippled from birth. Every day she used to take her down in to beach and make her swim in the water and walk on the land to do exercise. A part of my child hood passed by watching them doing exercise every day. They used not to miss a day without practice. She was also educating her by teaching her different subjects. She was so kind that she used to give free English lessons to the young people around her in the middle of all her works with her daughter. When I took my little daughter(1 year old) for 10 minutes walking exercise in the middle of our room last day, I felt boredom for a moment, then I remembered these neighbours and I came to my self again. the lens of mercy (Rahmat) which people keep dropping from their eyes and can not find them easily. This load, the lens, that they carry starts shining from the shoulders of these ants in the moment of bewilderment and desperation, then the public remembers the shining qualities on their shoulders, then they appreciate the worth of their own health and their families’ health, show more mercy to the people around them, then they make hamd to Allah with contentment by saying Al-Hamdulillah for everything, then they become more determined in their goal in the path of Haqq(Truth) and come to themselves again. The ones who live in Istanbul would know a site called Kumburgaz. There is a small mosque on the shore. One day we had gone to Jumah(Friday) prayer to this mosque. There was a man in front of me praying. When I finished praying, I looked at him while he was still praying(Salat). His legs were crippled, he nearly had no arms. He was trying to do sajda on the floor by touching his forehead on the floor only, as he had no hands and arms. do not know the value of their strength in youth and waste their energy by following the worldly desires(nafsanic desires). Now we are going back in time to the period of Asr-I Saadat. Lets remember the condition of Rasulullah (SAW) and his Ashab after hijrat. People at that time were asked to give whatever they can for Islam. Generosity of Hadrat Abu Bakr(R.A) is one of those who stays in our memories. They make a rivayat that Abu Bakr(R.A) had given everything he had for this cause. Him and his wife stayed at home with nothing but one cloth, which they were sharing between each other. Brothers and sisters do not say “why not two cloths?”! This religion is the religion of tawheed(Oneness)! Do you see another cloth when you go to Hajj, can you say they what the pilgrims wear are all different cloths? Lets get back to Hz.Abu Bakr (R.A). It is said that Abu Bakr (R.A). could not go out for the morning prayers because of being naked. When Rasulullah(SAW) realised this, he sent a man to his home to call Abu Bakr (R.A). to the prayer. When the man said to Abu Bakr(R.A) that he is called by Rasulullah(SAW), he had to go to the prayer. As his wife was wearing the cloth at this time, he went out and collected the date leaves to make him self a cloth to wear. He sewed the leaves , made a cloth and wore this cloth made of date leaves. When Abu Abu Bakr (R.A).came to the mosque, Rasulullah(SAW) said to him, “Your Rabb is pleased with you, are you also pleased with your Rabb”, He said “I am also pleased with my Rabb”. In a delicate moment like this, Abu Bakr(R.A) and his wife are shining with a lens on their back in the middle of public. How would we have found the lens of generosity that many people lost in bewailing and moaning while giving alms and zakat to poor people? How would we have found the lens of togetherness, brotherhood and unity in religion and society? How would we have found the lens of considering the others , helping and giving to them selflessly. Light of that lens, shined from the time of Asr-I saadat, and is still brightening us up here! In a way, they are carrying a timeless and placeless lens on their backs. 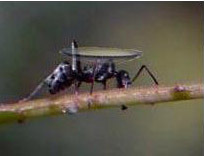 Like that ant carrying this contact lens on it’s back, they did not know that they would be memorised by us today. They were not aware that the light of Allah, who is Al-Wahhab, Al- Kareem, Ar-Razzak and Ar-Raheem, was going to reflect from them to today and tomorrows over the centuries. Lets move to another lens which is being carried now. There are those who carry knowledge and wisdom to benefit the others. As well as that, there are those who act with his knowledge and they also benefit the others with it. 1-A man whom Allah gave a wealth and guided him to spend it in reighteous way. It is very difficult to climb on the mountain of “the self”(mountain of the ego)! This mountain is very steep and it is not easy to climb on it! Many people lose their lenses while climbing on it! There are guide ants who are carrying “the lens of ilm and irfan: knowledge and wisdom” on their back for those who are climbing on to it. the truth and falsehood with their truth. Dr.Munir Derman (K.S) says “ Make friends with an ant!”. There are such ants separating the rice from the sand and they carry those lenses on their backs. Seek for those ants even if you have not lost your lenses. Take off the ones in your eyes and replace them with those who they carry on their backs. Seek for the contanct lenses patented with “Naql: Divine knowledge coming from Allah” . Al- Kareem: The Generous. whose generosity is most abundant. Ar-Raheem: The All compassionate who acts with extreme kindness. Ar-Razzak: The Sustainer who provides all things useful to His creatures. Al-Wahhab: The Giver of All who constantly bestows blessings of every kind selflessly without expecting anything back from the ones who He bestows blessings. This entry was posted on Pazartesi, Temmuz 14th, 2008 at 10:58	and is filed under Islam. You can follow any responses to this entry through the RSS 2.0 feed. You can leave a response, or trackback from your own site. Mersi boku. Good news. I’ll become your constant visitor. and the second I wanna say…Allah cc order to live into the tevhid…Allah dont wanna muslıms go different ways…we dond need leader about islam Kuran an our prophed Hz muhammed (s.a.v)should enough us…only we need teacher who gonna gıve informatıon…prayıngs and willings can get only from Allah…Allah ıs omnıpotent…. Ve Alaikumma Salaam My kind friend Ensonhaberdar. Many thanks for your beatiful comments related to islam and brotherhood. I agree with you in all the points you made. We will try to do our best in order to give service on the path of Allah j.j. in Muhammedinur english section as well. Our aim is to introduce islam to people by following the laws of Allah and His Rasul (SAW). Thank you for this site, I love the story and it really inspired me today. I will try to add more documents in here in time inshaallah. I must say that I can not catch up with the routine of the life at the moment. Again many thanks for your kind words. Whatever you see good it is from Allah, what ever mistake is done it is from my own nafs. Allah knows best.